Add in the live alligators and you have a winning recipe for success, according to Kroeger. Fudpucker’s is in its 33rd year and growing. Indeed, many of his employees have been with the company for more than 10 years, and all new employees are welcomed into the family and given an opportunity to grow. Coming from the boss man himself, the staff has made Fudpucker’s what it is today. Let’s face it, so have the catchy name and live music, offered seven nights a week in Destin and three times weekly at the Island location. On weekends, you can reel in great specials at FudShucker’s, the in-house steam shack and raw bar. They host a shrimp boil every Saturday and a BBQ every Sunday, featuring some of the best drink prices on the coast. And Kroeger became “Father Fud.” Fresh out of college and out of money, he was too proud to call up Mom and Pop, so he started working in a nightclub that let him run the snack bar. That’s where Fudpucker’s got its humble start more than three decades ago, serving a limited selection of FudBurgers, FishPuckers and FudDogs. Then came those famous T-shirts, which the owner says catapulted his business to the big time. Today’s Destin location opened in 1989 across from Henderson Beach State Park. 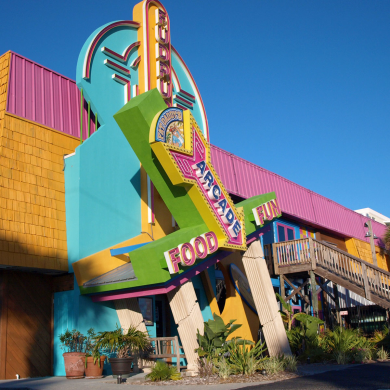 The original Fort Walton restaurant opened in 1985, before space constraints merited a move to the larger waterfront property on Okaloosa Island in 2013. The new venue prompted a fresh Fud-venture in Fudpucker’s Water Sports. Just head out back for parasailing, jet skis, pontoon boats, kayaks and paddleboards. You can also book fishing charters or catamaran cruises just a stone’s throw from your table. For the kiddos, don’t pass up Fat Daddy’s Arcade to play skee-ball and video games, and either Gator Beach (Destin) or Gator Island (Fort Walton) to get up close and personal with reptiles. The Destin venue offers live shows during the season, and you can have your photo made holding a small gator at the newer attraction on Okaloosa Island. Kroeger has a fud-tastic answer. Find out what the ‘fud’ is all about by visiting Fudpucker’s In Destin today. And don’t leave without buying a T-shirt!